We have added some new titles to our book display in Library Room 1. You can keep up to date with all our new acquisitions on LibraryThing or subscribe to our new books RSS feed. 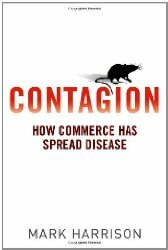 Written by the director of the Wellcome Unit for the History of Medicine at the University of Oxford, Professor Mark Harrison, this books examines the relationship between disease and the social, political and economic effects of commerce. Dr Charles Duguid was a Scottish doctor who moved to Austrialia and campaigned for the civil rights of Austrialian Aborigines. This book is based on Dr Kerin‘s PhD thesis on Dr Duguid. William Bland was a London-born surgeon who was sent to Australia as a prisoner after a duel. He was actively involved in many aspect of Austrialiam society, including legislative development, the founding of eductional and medical institutions and a doctor and surgeon who published in various medical journals. This entry was posted in Collections, News and tagged new books, surgery, WUHMO on 27 November 2012 by .